With its sleek futuristic look, this powerboat is just the sort of boat 007 might use to get out of a tight spot, but this boat has a purpose. Iit was designed to break the world record for circumnavigating the globe on 100 per cent renewable fuel. The Eearthrace project aimed to shave 10 days off the 75-day record while increasing awareness of environmentally-friendly biofuels. The craft can submarine through heavy seas and notch up a higher average speed than regular boats by going up to seven metres under water. As well as looking cool, the horns at the back also let air in when the boat is underwater. A crew of four will began the 24,000 nautical mile journey from Valencia in Spain in June 2008. The amazing Eearthrace vessel set a new world record for a powerboat to circle the globe, and she did this with 100% renewable biodiesel fuel, and a net zero carbon footprint. The voyage took 60 days, 23 hours and 49 minutes, smashing the old record by over two weeks. 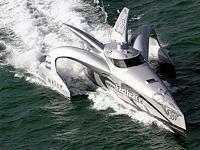 The sleek silver boat is worth £1.5 million and was skippered by New Zealander Pete Bethune.